Where the name topaz comes from is not clearly identifiable. Some say that it comes from ancient Sanscrit and some say it comes from ancient Greek. Others say it came from the Latin word Topazus through the Old French word Topac. But by any name, it is a beautiful gemstone. 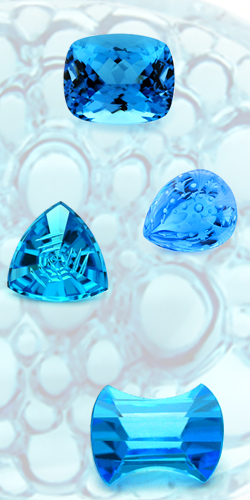 Topaz, like many natural gemstones, is a gemstone of the ages. Some say that the Egyptians believed that golden topaz got its golden glow from the god of the sun. Increased strength and the ability to make the wearer invisible were two attributes given to topaz by ancient Greeks. Topaz can be found in nature in several colors including light blue, pink, red, purple, orange, yellow, brown and gray but without a doubt the most plentiful type of topaz found is colorless (white). Because natural blue topaz is very rare, most blue topaz on the market these days is colorless topaz that has been enhanced. Good quality Imperial or Precious topaz is not readily available at most jewelry stores these days and when one does discover a piece of jewelry with Imperial or Precious topaz it is unfortunately usually not the best color.